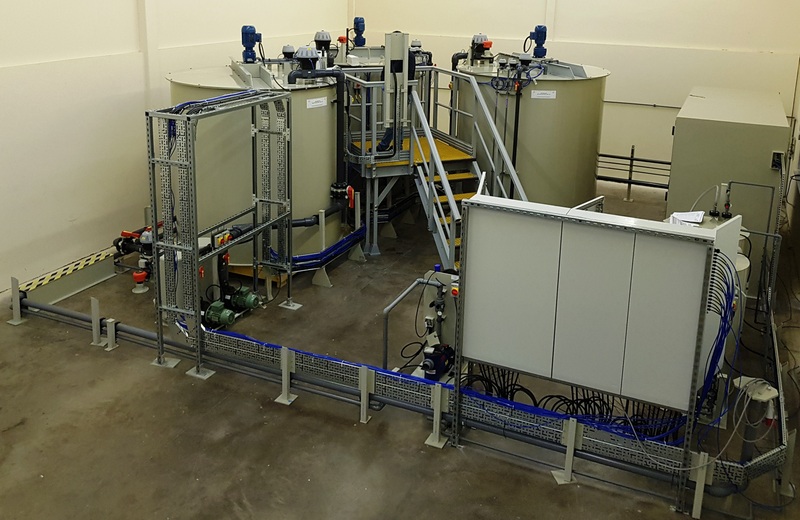 We design and supply both water and wastewater treatment plants for a very wide range of chemical and general industrial applications. Over the past few years, the number of new R&D facilities attached to some of our Universities has grown significantly. Clearly, when it originates from R&D facilities, the flow, type and content of wastewater discharged is not constant or entirely predictable. The plant which treats the wastewater must therefore be flexible and constantly monitor the quality. We recently supplied the plant (right) to one of the UK’s major Universities. The picture shows the plant, completely pre-assembled in our workshop. The client attended factory testing before delivery to site. This high degree of pre-assembly drastically reduces site installation time. 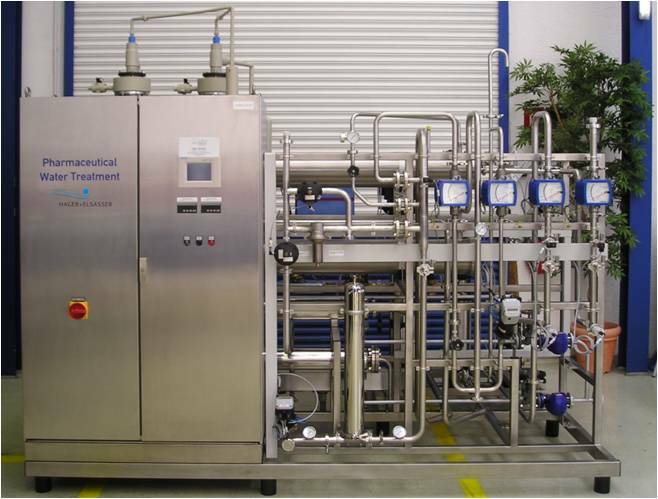 The plant automatically monitors the pH, Total Organic Carbon (TOC) and flow rate of the treated wastewater. It then discharges to foul sewer. It is also quite normal in R&D environments to use very pure water as part of the process. Obviously, when undertaking such highly sensitive test work, you must be very sure not to introduce impurities that could have a completely unknown effect on the work being done. It is therefore quite normal to include a water treatment facility as part of the scope of supply. Exactly what type and size of plant required depends completely on the specification of water quality required and the overall flow rate that must be delivered. Reverse Osmosis (RO) to remove most of the Dissolved Salts present in the water supply. Final Ion Exchange to remove trace Dissolved Salts following the Reverse Osmosis stage. The picture (right) shows a very small system, pre-assembled and ready for delivery to site. each client’s particular analysis requirement. The picture (right) shows just one part of a treatment plant treating laboratory wastewater. In this particular case, one of the specialities is the analysis of mineral ores. Companies across the world then refine them but the initial content has to be confirmed. The “impurity” content that is present. Clearly this varies enormously in both its nature and concentration. The chemicals used in the analytical processes. To be clear, the impurities present often include highly toxic ones. These are very carefully removed to ultra-low concentrations. This ensures that the treated wastewater then discharged really is environmentally-friendly. 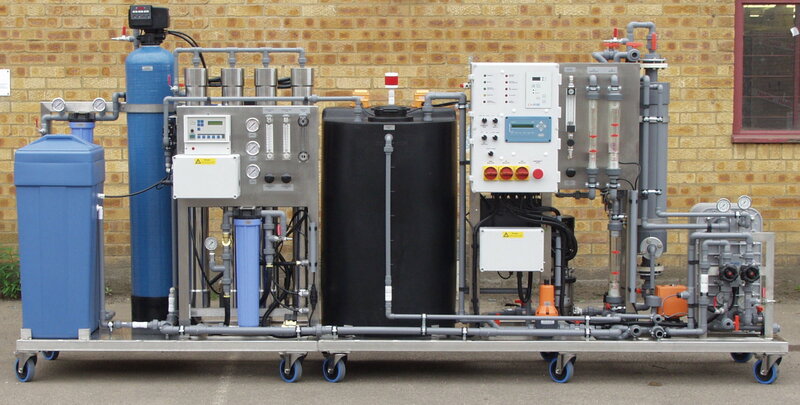 One of the most important requirements in the pharmaceutical sector is the use of highly purified deionised water. This ensures that often-injected products do not contain unwanted impurities! So, treated water quality is very important. This is always true, whether the water is used just for cleaning the manufacturing equipment, or used as part of the end product. 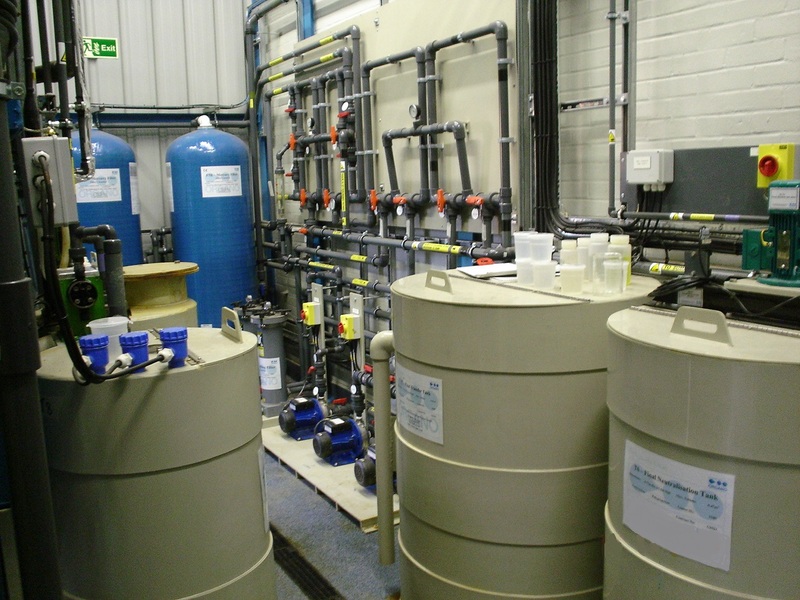 Whether you need Purified Water (PW) or Highly Purified Water (HPW), we will supply the entire system including production, storage and distribution. 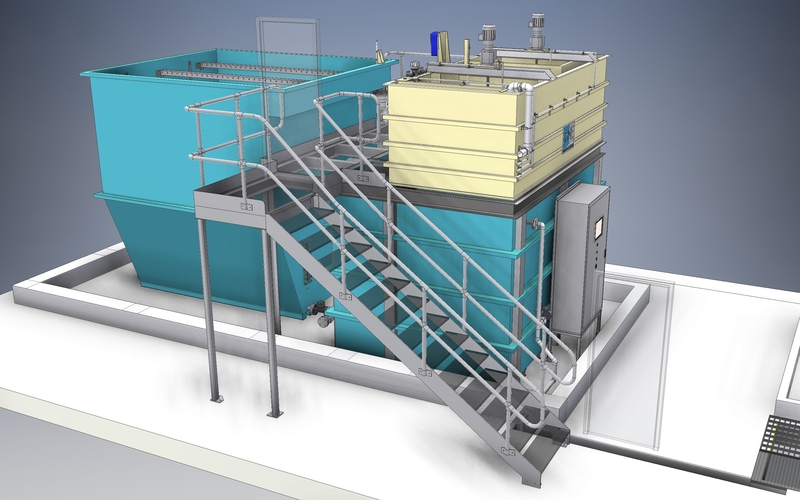 The picture (right) shows a small pre-assembled water treatment system. H+E has been designing water & wastewater treatment systems for more than 80 years. We provide both customized and standardized solutions which meet the highest international quality requirements, documentation and validation criteria. We have successfully completed more than 220 projects in this sector alone. Companies in this sector also purchase chemicals in 1m3 capacity Intermediate Bulk Containers (IBCs). In such cases, connecting the outlet of the IBC to enable the contents to be used can be a Health & Safety risk. Very often, the user changes the IBC for a new one before the existing one is completely empty. This wastes chemical and costs money unnecessarily. In such cases, our SecureChem™ systems provide significant benefits. You can find out more about them here. The manufacturing of cosmetics involves the use of a wide range of chemicals. Therefore, we treat the produced wastewater to ensure it can be safely discharged to our environment. The picture (right) shows a typical plant to treat such wastewater. Installing the plant inside a small custom-made building makes taking pictures of the whole plant impossible. Therefore, this 3D view (below) is the only way to get an impression of the plant. Please download more information including Brochures, Case Histories and Reference Lists here. We are also very happy to discuss your specific needs with you so please do feel free to contact us.